Air Niugini | Papua New Guinea's National Airline | More Aircraft Maintenance Engineers (AMEs) return to Air Niugini. Air Niugini > About Us > News > More Aircraft Maintenance Engineers (AMEs) return to Air Niugini. 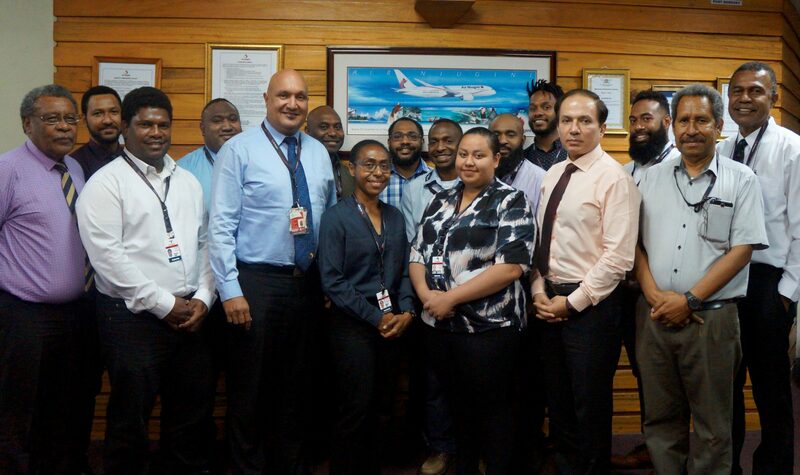 Following the completion of their four year training at the Air New Zealand Aviation Institute in Christchurch, New Zealand, ten Air Niugini Aircraft Maintenance Engineers (AMEs) including two females have returned to Port Moresby and joined the aircraft maintenance workforce at Air Niugini Engineering. The AMEs include Patrick Misina, Melvin Paru, Breanne Ume-Taule, Simon Silas, Temuera Samuel, Dennis Kasup, Bernard Kari, Branden Boeha, Jeremy Camillus and Miriam Tai whose training was fully funded by Air Niugini under its Engineering Cadet Program. It cost the airline over K6million to train the ten AMEs. Air Niugini Chief Executive Officer, Mr Simon Foo in welcoming them home yesterday said the airline invests a lot of resources into training young Papua New Guineans and the results are very rewarding. Following a four year cadet program, it normally takes 12 to 14 months before the AMEs can get their PNG License. An Aircraft Maintenance Engineer (AME) is a trained person who does the maintenance requirements of the aircraft including aircraft servicing, parking, jacking, component replacements, inspections, defect, troubleshooting, modifications and repairs. Air Niugini currently has 32 AMEs, 4 of them are female. Mr Foo added that the Board and management of Air Niugini will be investing in hangar facilities at the Jacksons airport that will eventually allow heavy maintenance of aircraft to be carried out in Papua New Guinea, resulting in cost savings and further up-skilling of the Papua New Guinean work force. In 2017, the first Dash 8 aircraft heavy check was done in Port Moresby and Air Niugini expects another to be completed mid this year. “This will reduce overseas expenditure as well as build the PNG Engineering staff capacity. These ten AMEs are fortunate to be among those who will be using this facility and they are the future of Air Niugini.” Foo said. Meanwhile, Mr Foo also said Air Niugini is working to improve and standardize its employment packages for pilots, so that it can retain and attract the pilots it needs to fulfill the future expansion plans of the airline. An announcement on these changes will be made shortly.